W.L. 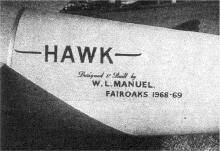 “Bill” Manuel, who had designed and built four types of gliders starting as early as 1929 and which later culminated in the Willow Wren of 1932, designed and built the Hawk glider as a project for his retirement. 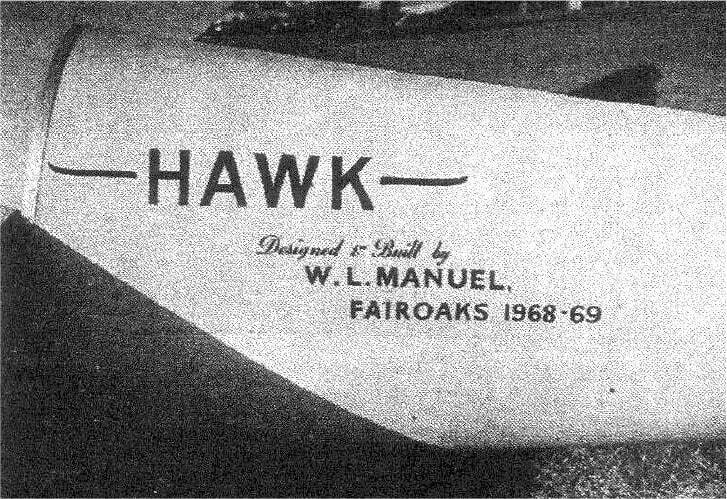 The Hawk was to be a single-seat sailplane in all wood construction with a cantilever shoulder wing and designed especially for soaring in weak thermal conditions. 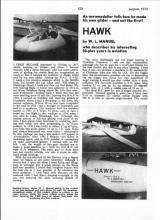 In January, 1968, he retired from the position of Chief Planning Engineer with A .C. 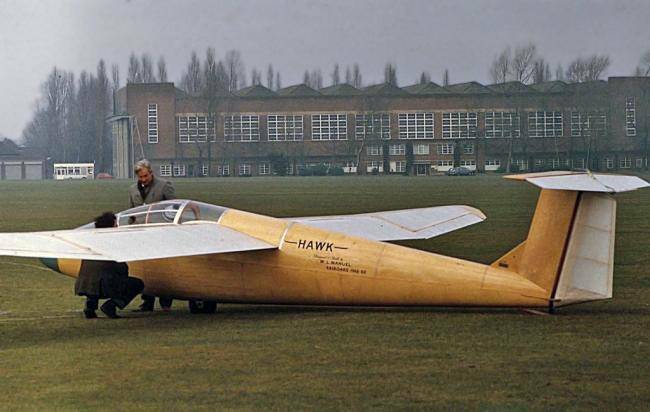 Cars Ltd., and having already previously designed the Hawk, built it at Fairoaks Aerodrome, Surrey between1968-1969. 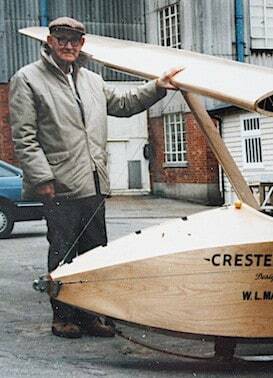 It was first flown at the College of Aeronautics at Cranfield on 25 November 1972, piloted by Howard Torode of the Cranfield Institute. 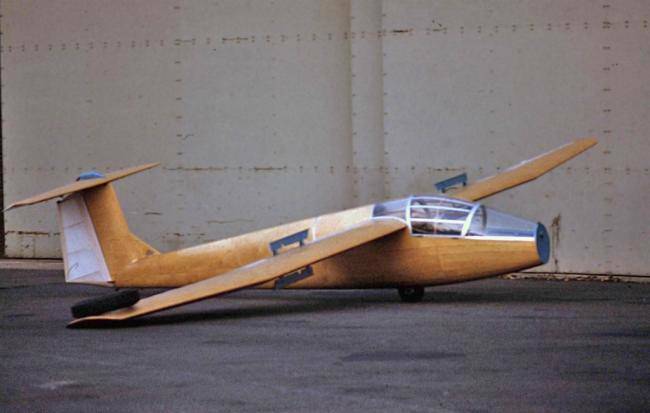 The single wheeled fuselage had a conventional serni-monocoque structure with plywood-covered spruce. 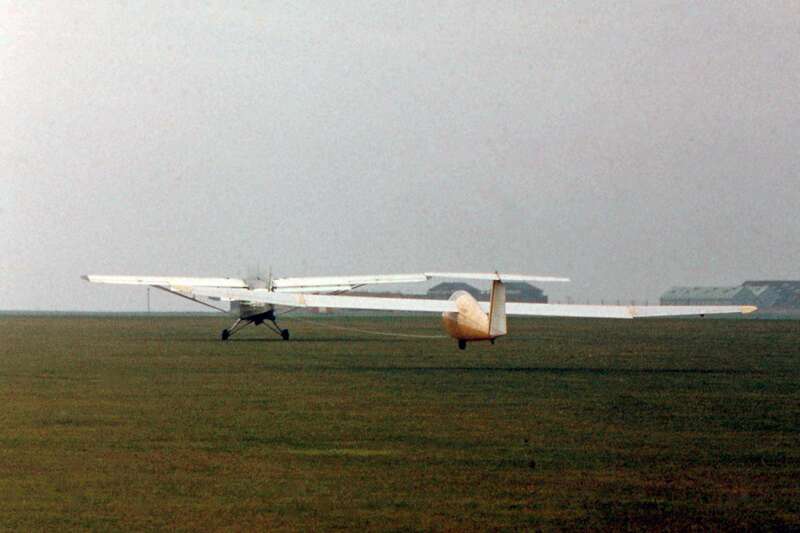 The unusual canopy was arranged in three pieces: the front and rear sections being fixed one-piece single curves, whilst the middle section was a double curve mounted on a hinged frame. The fin, which supported the T-tail and tailplane were also plywood covered, with fabric covering the moving surfaces of the rudder and elevator . 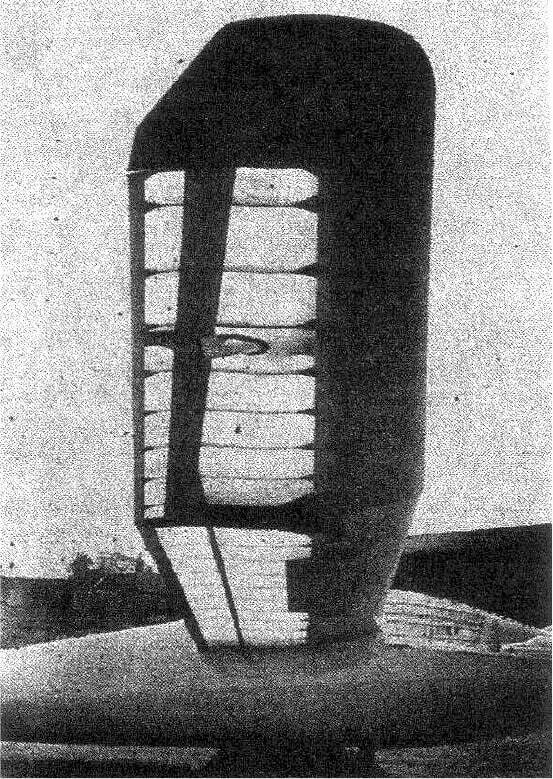 The elevator was fitted with a Flettner-type trim tab on its starboard edge. 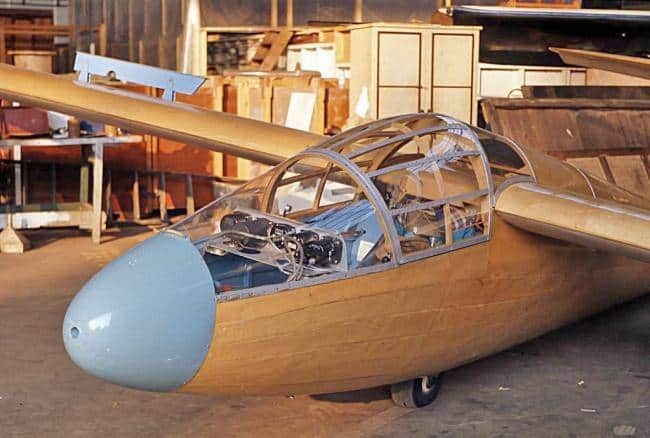 The aircraft is beautifully finished with a high polish on the natural wood and clear dope on the fabric which gave the general appearance of a classic glider from years earlier. 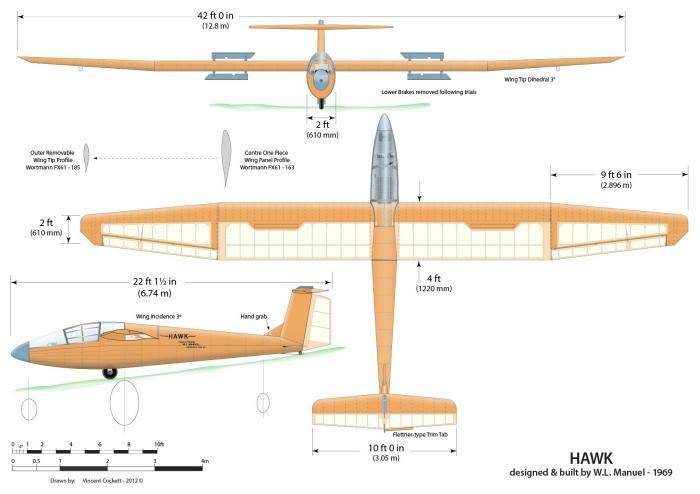 Attention to detail had been absolute and even the aileron linkages were shrouded. All the metal parts not requiring welding were made from stainless steel. 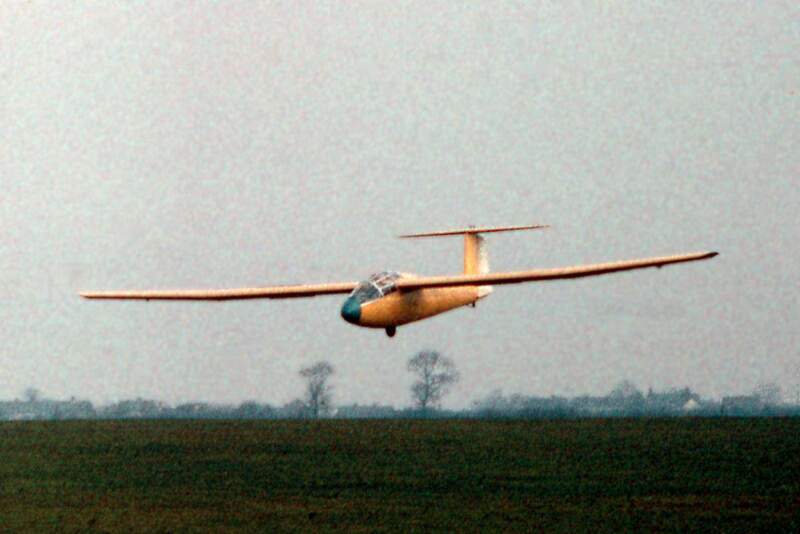 Photos above taken on the 26th Nov. 1972, the day after the maiden flight. 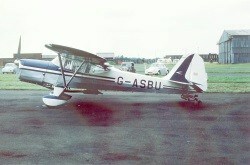 The first flight was on 25 November 1972 and was towed by a Beagle A.61 Tugmaster 2, registration G-ASBU and piloted by Derek Wicox. 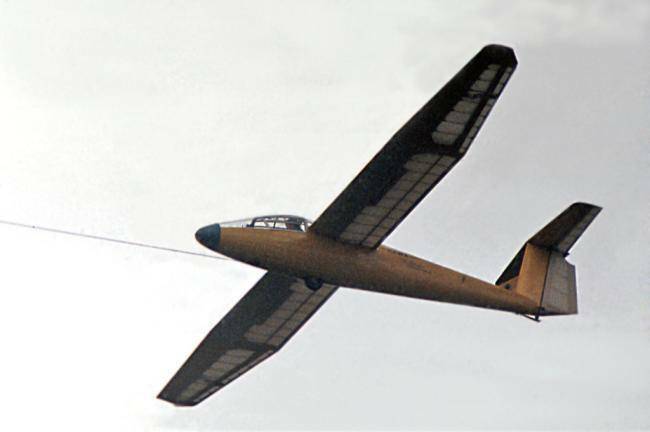 Tests showed a lack of rudder power, but after some modifications, including increased rudder area, removal of the airbrakes from the lower wing surfaces and an alteration to the aileron controls, the aircraft finally prooved itself. 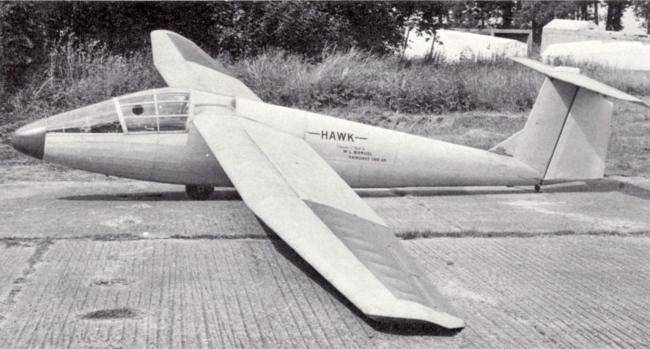 Only one Hawk was ever built. 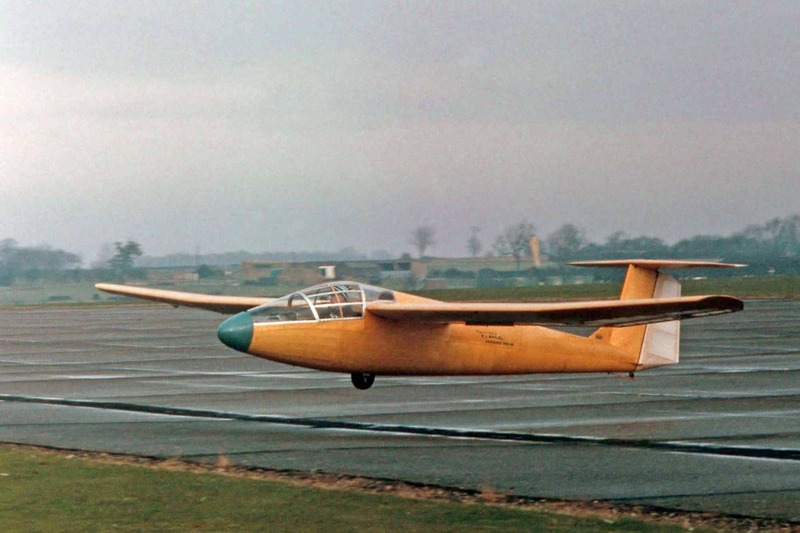 It was certified as BGA 1778 in February 1973 and was entered in the annual 1973 PFA rally held at Sywell where it gained third place in a competition for best home-built aircraft.